Here’s To A Fatt Choy Chinese New Year! 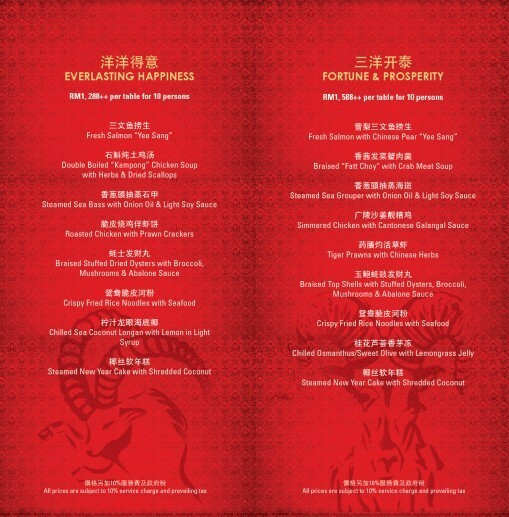 The newly refurbished Toh Yuen Chinese Restaurant at Hilton Petaling Jaya is back, just in time to usher in the Chinese New Year of the Goat with grace and elegance. Toh Yuen’s ambience is modern and sophisticated with injections of Oriental inclusions. The whole restaurant is spaciously designed and even features an open kitchen where guests are able to catch some kitchen actions, especially during dim sum hours. Toh Yuen’s graceful interior is cleverly presented through its refined themed of pale cream with grey, celadon green, gold and dark wood colors. The whole space is set with comfort in mind, hence the spacious settings of the dining that is also cleverly sectioned to offer privacy. The whole ambience is clean, stylish with a minimalist elegance. 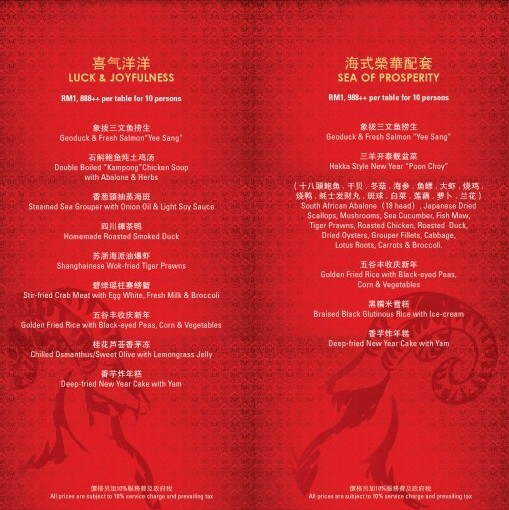 The relaunch of Toh Yuen kicked off with a big bang as Chinese Executive Chef Sam Lu has prepared a Fatt Choy Chinese New Year Feast filled with various CNY 2015 set menus. Toh Yuen, which translates as Peach Garden, has been serving Cantonese cuisine to many since it first open together with the hotel. Dinner commenced with the obligatory auspicious salad, this round featuring Salmon & Chinese Pear Yee Sang. 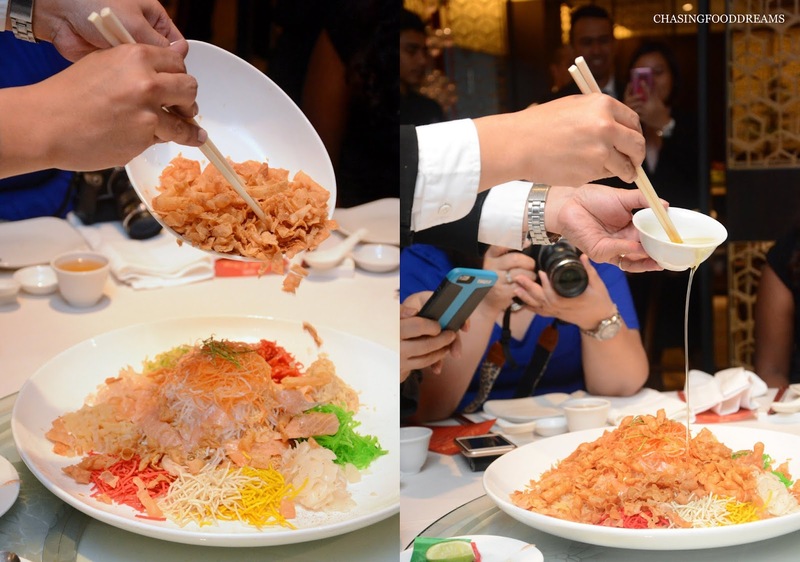 From the usual ingredients to the addition of juicy pomelo sacs, crunchy jelly fish, pickled vegetables, pok chui, crushed peanuts, sesame seeds and the choice main ingredients of luscious salmon slices and refreshing pear batons, the yee sang is a burst of flavours and textures. I doubt I can even get tired of savoring yee sangs as these are always a fresh start to any meal. Chef Sam feels everything comes better in pairs and so this year, Toh Yuen’s Yee Sangs features a pairing of Fresh Salmon & Abalone, Geoduck & Jelly Fish, Fresh Salmon & Jelly Fish, Jelly Fish & Seaweed and Chinese Pear & Jelly Fish. Besides the pairing, there are additional sides that one can opt to add to the yee sangs. Our soup course features Braised Fatt Choy Crab Meat Soup, a tureen full of warming flavours. The thick bisque has sweet crab meat with crab sticks and other bits of seafood with fatt choy and finished with a sprinkling of coriander to freshen up the flavours. I always am a stickler for soups like these as they are very warming and satisfying. Steamed Garoupa with Onion Oil & Light Soy Sauce may be classic but it is always satisfying. Simple dishes like this showed off the sweet nuances of fresh fish that only requires aromatic oil and soy sauce as a light boost. The restaurant offers various choices of fish so make sure to ask for your favorite one. Many Chinese households enjoy a good poached chicken, especially during festive occasions. Simmered Chicken with Cantonese Galangal Sauce takes the traditional dish and put a twist by serving it with sand ginger sauce. The ‘keong yong’ sauce has sand ginger, making it more delicately mild compared to the regular ginger which as a stronger and rustic note. Nevertheless, I enjoy the tender and moist chook with the sauce as it reminded me of old school flavours that many enjoy despite its simplicity. Tiger Prawns with Chinese Herbs is another dish that truly epitomizes freshness is the key in any Chinese meal. The tiger prawns are superbly sweet and firm and lightly poached in a Chinese herb broth. The oceanic sweetness really stood out and it was very pleasurable to savor the crustaceans in their own natural juices. The next course of Braised Top Shells with Stuffed Oysters & Mushrooms impressed many that evening. The dish showcased plump fish paste with black moss dumplings stuffed with dried oysters, braised top shells, fleshy mushrooms and broccoli all braised in Chinese style brown seafood sauce. It’s very easy to enjoy this dish as the flavours are well balanced and not overpowering at all. Crispy Fried Rice Noodles with Seafood is a big favorite of mine that night. Cleverly incorporating two textures of deep fried crispy rice noodles and sautéed soft rice noodles, the dish has a wonderful textural feel to it. The delicate starchy seafood sauce has just enough flavour to enhance the rice noodles and yet I can taste the aromatic rice noodle flavour which is what makes this dish so yummy. Dinner ended with Steamed New Year Cake with Shredded Coconut and Osmanthus Olive with Lemongrass Jelly. I could never resist Nian Gao so dessert is always a favorite course for during CNY season. The Osmanthus Olive with Lemongrass Jelly is well chilled and makes a refreshing exit to our Fatt Choy CNY feast! 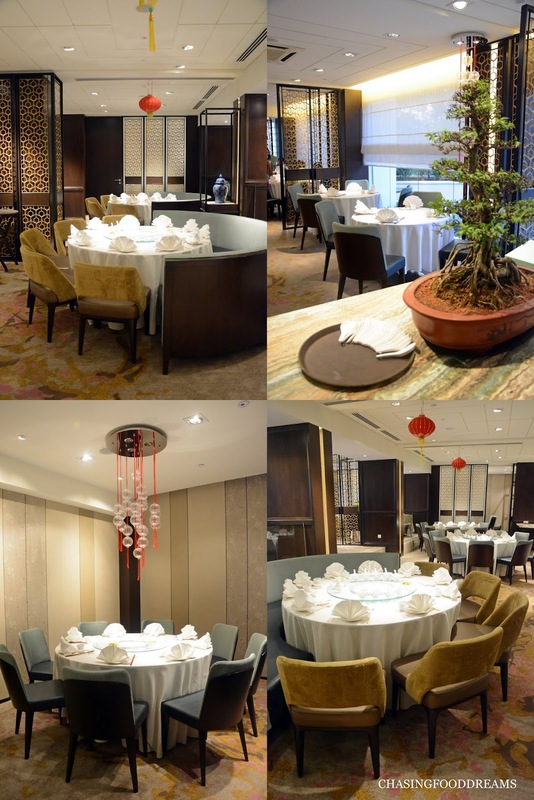 The ‘Fatt Choy’ reunion dinner and lunch sets are available from 27 January to 5 March 2015. 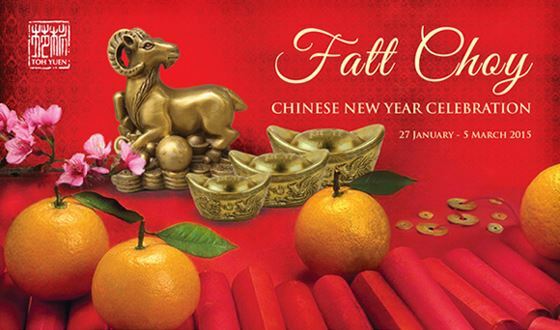 Usher in the auspicious New Year with Oriental delicacies at Hilton Petaling Jaya. Toh Yuen Restaurant remains open on the Eve of Chinese New Year and throughout the 15-day celebrations. Would it be wrong if I say that I just want to go there mainly for the stunningly gorgeous interior! I have been wanting to have good salmon. Wish I lived nearer.